At Healthcare Scene, we’ve always provided readers the option to get the latest Healthcare Scene blog posts right in their email. As we continue to expand the content we write, we’ve been working to allow readers to target the content that interests them most. We started this trend by launching HIM Scene along with CXO Scene and now we’re excited to announce the launch of the Healthcare Optimization Scene. To start, we plan to send out about 1 email per week of highly focused, quality content that looks at the challenges associated with implementing and optimizing large healthcare IT systems like EHRs and ERPs. If you’re interested in optimizing your EHR or ERP solution, enter your email below and you’ll get excellent commentary and insights from our resident healthcare optimization expert, Brian G. Rosenberg, straight to your email. We appreciate all your support! We hope you’ll enjoy the EHR and Healthcare ERP focused content. If you have any suggestions on how we can improve Healthcare Scene or the new Healthcare Optimization Scene, we’d love to hear it. We’re excited to announce that @techguy (John Lynn), Founder of Healthcare Scene, was selected as a HIMSS Social Media Ambassador for the HIMSS 2016 Annual conference in Las Vegas. It’s a real honor that the HIMSS team would recognize Healthcare Scene’s influence on healthcare social media. We’re excited to be part of such a dynamic group of individuals who care about healthcare and the way technology can impact healthcare as much as we care. If any of you will be at HIMSS in Las Vegas, Healthcare Scene will be participating in a number of great events including the Healthcare IT Marketing and PR Community Meetup and hosting the New Media Meetup. We look forward to seeing many of you at the event! Don’t be shy. Come up and say hi if you see us there. At Healthcare Scene, we’ve always provided readers the option to get the latest Healthcare Scene blog posts right in their email. As we continue to expand the content we write, we’ve been working to allow readers to target the content that interests them most. We started this trend by launching HIM Scene and now we’re excited to announce the launch of the Health Care CXO Scene. To start, we plan to send out about 1 email per week of highly focused, quality C-level executive content. If you’re interested in CXO related topics, just enter your email below and you’ll get the latest and greatest C-level executive commentary from our resident hospital CIO expert, David Chou, straight to your email. Thanks for all your support! We hope you’ll enjoy our C-level healthcare executive focused content. If you have any suggestions on how we can improve Healthcare Scene or the new CXO Scene, we’d love to hear it. When Health IT (HIT) professionals do their jobs well, many people don’t know they exist. Because of this, HIT has a growing number of rockstars who just don’t get the attention they deserve. 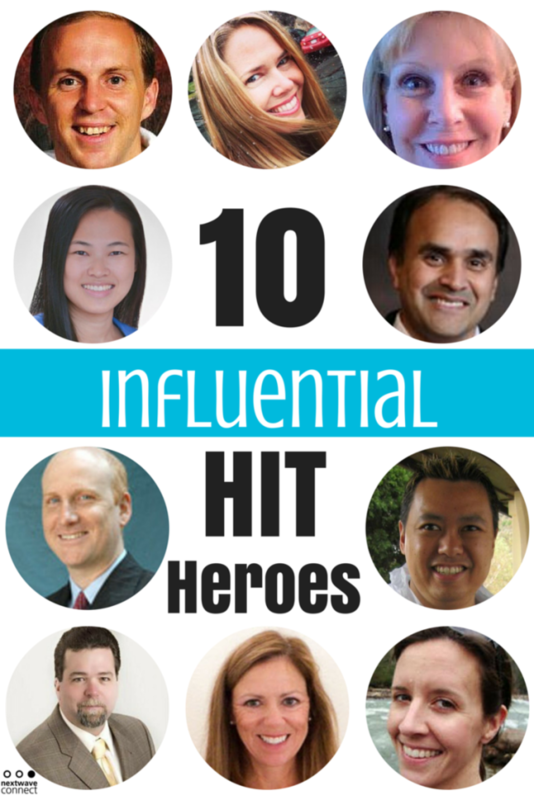 On this 10th anniversary of National Health IT week, we want to honor some of those influential HIT Heroes. Thank you Next Wave Connect for the recognition and we’re excited to be part of such a great group of health IT influencers. Be sure to check out all of the lists that have recognized Healthcare Scene blogs and bloggers. Healthcare Scene is proud to announce the details of the 2016 Healthcare IT Marketing and PR Conference (HITMC). We attend a lot of health care IT conferences throughout the year, but we’re a bit partial to HITMC since we organize the event. We’d like as many in the Healthcare Scene community to be able to attend the Healthcare IT Marketing and PR Conference (HITMC). So, we’re offering a $100 discount off the registration price for Healthcare Scene readers. All you have to do is use the promo code: HITrocks during registration and you’ll receive $100 off the already discounted early bird price. That’s $600 off the regular registration price! Be sure to register now since early bird pricing is over on November 15, 2015. Also, if you advertise on Healthcare Scene or post jobs on Healthcare IT Central and would like to attend, let us know by email or on our contact us page and we’ll give you an even better discount to attend the event. Thanks for all of your support of Healthcare Scene and now the HITMC! The healthcare technology community is abuzz these days with a number of key topics from mHealth to patient engagement, senior care to ACOs, ICD-10 to EHRs. There are so many diverse insights and smart perspectives joining the discussion against the ever-shifting backdrop of care delivery. 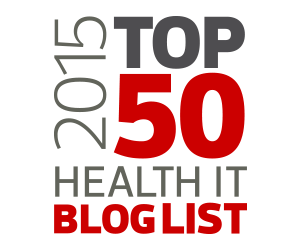 In an effort to showcase many of the great voices lending their expertise to the conversation and raising the important questions and new ideas in health IT, we continue the tradition with our third 2015 list of Top 50 Health IT Blogs. We’re really proud to have CDW include us on this list multiple times as they have done in past years as well. Plus, when we look at many of the other blogs on their list, we’re proud to be in such great company. Thanks for reading and all your support! 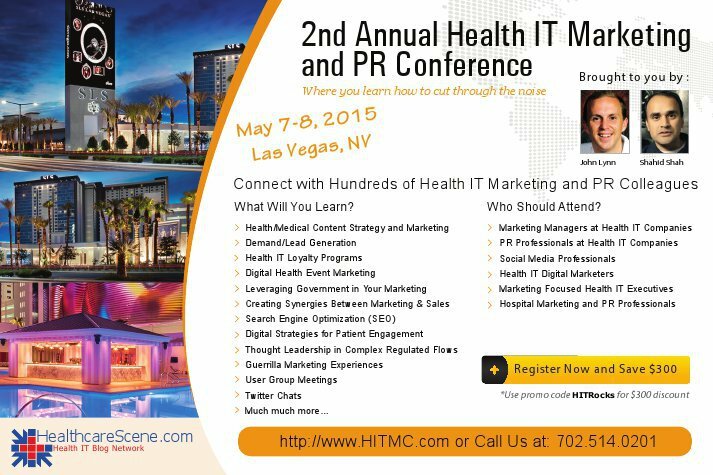 Healthcare Scene is excited to organize the 2nd Annual Health IT Marketing and PR Conference (HITMC) in Las Vegas. This is the first of its kind event that’s every design is to bring together the Healthcare IT Marketing and PR community. We’ve done that in a really amazing way. Also, we’ve started posting the speaker profiles on the speaker page and a preview of the Health IT Marketing and PR 2015 sessions. We’ve got a few other secrets about the conference that we’ll be announcing in the future. The conference is backed by an amazing group of sponsors. These companies represent some of the best companies out there when it comes to healthcare IT. We’re still adding more as we get closer to the event, but this event would not be possible without their excellent support. We hope that many in the Healthcare Scene community will join us in Las Vegas! We’re excited to access to all of the great Healthcare IT Today content in one email newsletter. Just sign up below and receive the latest healthcare IT content right in your email inbox. If you have any questions, please let us know in the comments or on the contact us page.